HTC EVO 4G Release Date – June 4, 2010. This is how it was supposed to go. Back in November of 2007 Google announced their Android operating system and the game was supposed to change. 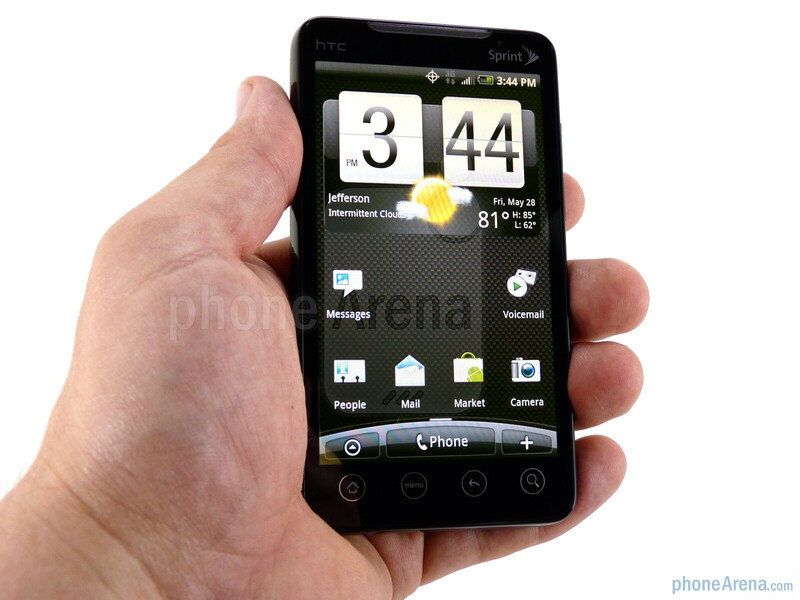 A year later T-Mobile and HTC released the platform’s first handset, the G1. We had high hopes, to say the least, but the impact was not immediate. The revolution grew slowly, but now it is coming to a head. HTC brought their Sense UI to Android with the Hero, but the first major blow across Apple’s bow was the Motorola DROID, followed by the Nexus One and most recently the HTC DROID Incredible. 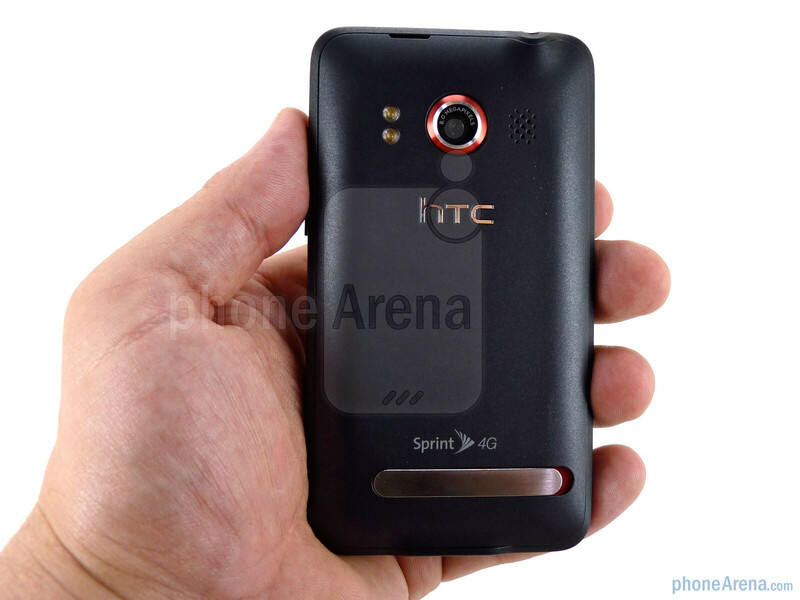 All this was a prelude to what’s next: say hello to the HTC EVO 4G. The EVO 4G has specs that are unmatched by any phone before it: 4G connectivity, 1GHz Snapdragon processor, HDMI out, HD video capture, dual cameras including an 8 megapixel main sensor, 4.3” display, mobile hotspot, YouTube HD, kickstand…the list goes on. All of this is backed by Sprint’s growing 4G network which gives users up to 10x the speed of 3G. This, finally, is a phone that can go toe-to-toe with the iPhone and beat it. Handily. It's fast, it's personal, it's glorious. Included with the EVO 4G you’ll get an AC adapter and data cable, as well as an 8GB microSD card. The HTC EVO 4G is very similar in design to the HD2, but when you have a 4.3” screen there isn’t much else you can do with the phone. 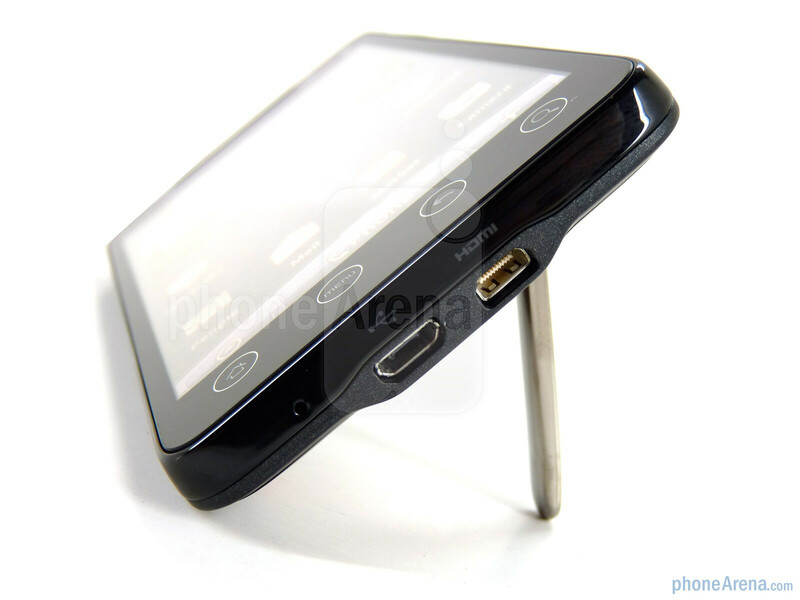 Instead of physical buttons as on the HD2, the HTC EVO 4G has four flush capacitive buttons: Home, Menu, Back and Search. These buttons work flawlessly, unlike the Nexus One which gave us problems and had to be touched just so. 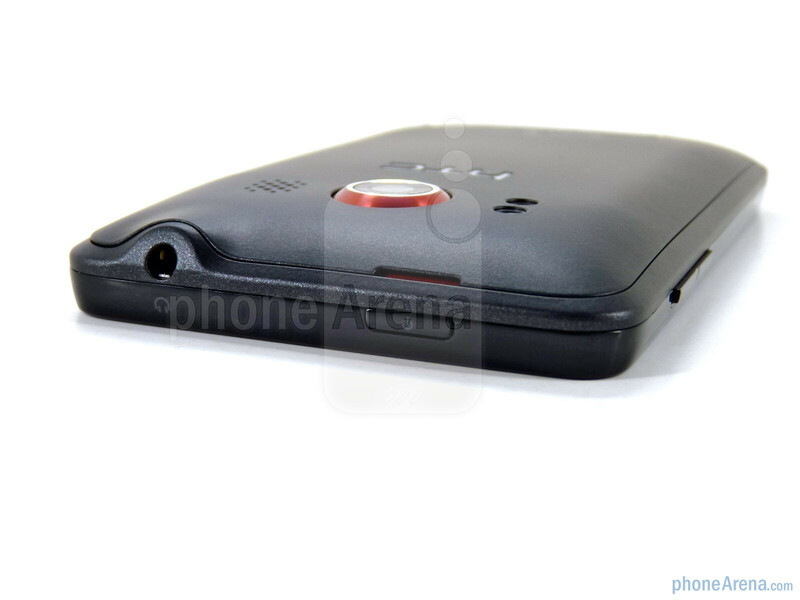 At the top is the silver earpiece grill, and to the right of that is the small front-facing 1.3MP camera. The rest of the phone is equally simplistic: a volume rocker resides on the right side, the top houses the 3.5mm headphone jack and power button and the bottom features the microUSB and HDMI ports. The side buttons all offer good travel, and while the volume rocker raises more prominently from the housing both it and the power button are easy to operate on feel alone. 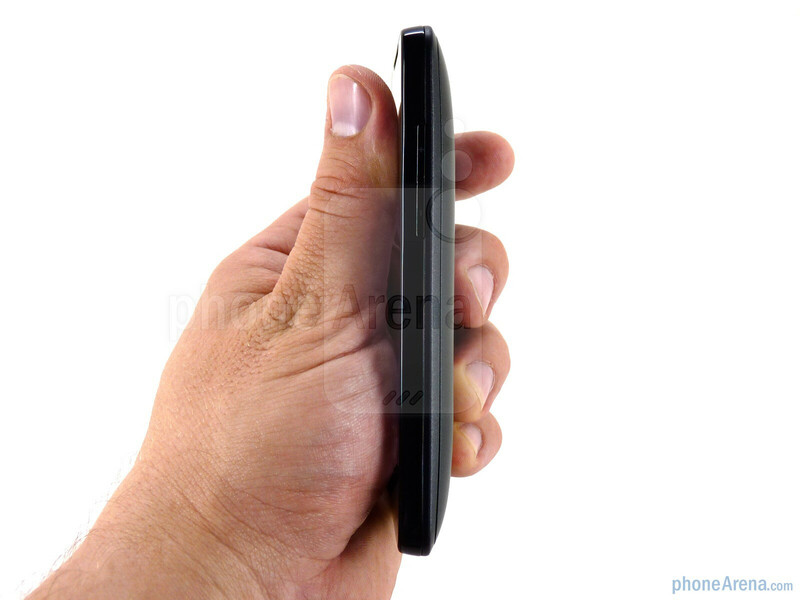 You can compare the HTC EVO 4G with many other phones using our Size Visualization Tool. 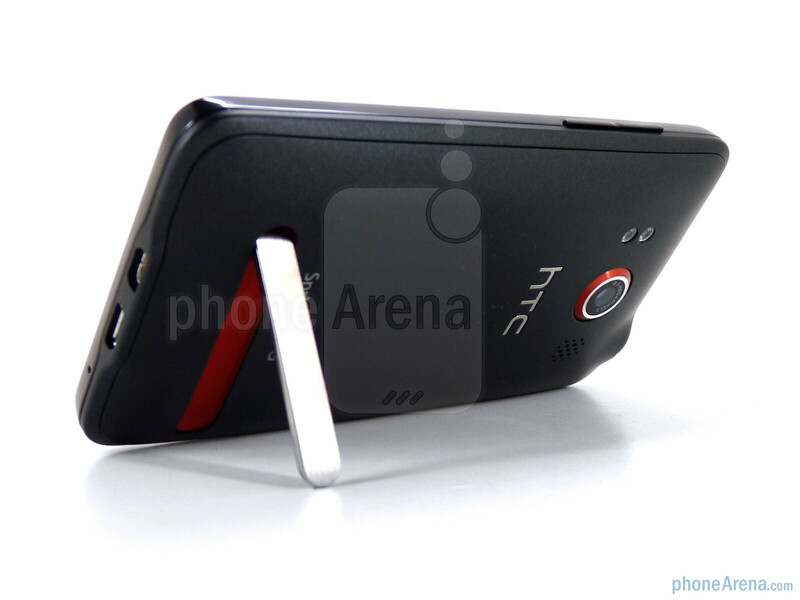 The back of the HTC EVO 4G houses its 8 megapixel camera near the top, with the dual LED flash to the camera’s left and the phone’s single speaker to the right. Near the bottom is the aluminum kickstand. The spring-assisted hinge is very smooth and solid, and we don’t foresee any issues with it loosening up as time goes by. The microSD slot is placed under the battery and has a unique latch mechanism that makes it pretty difficult to remove, but with an 8GB card most users won't be taking it out and the ones who do probably will do so only once. 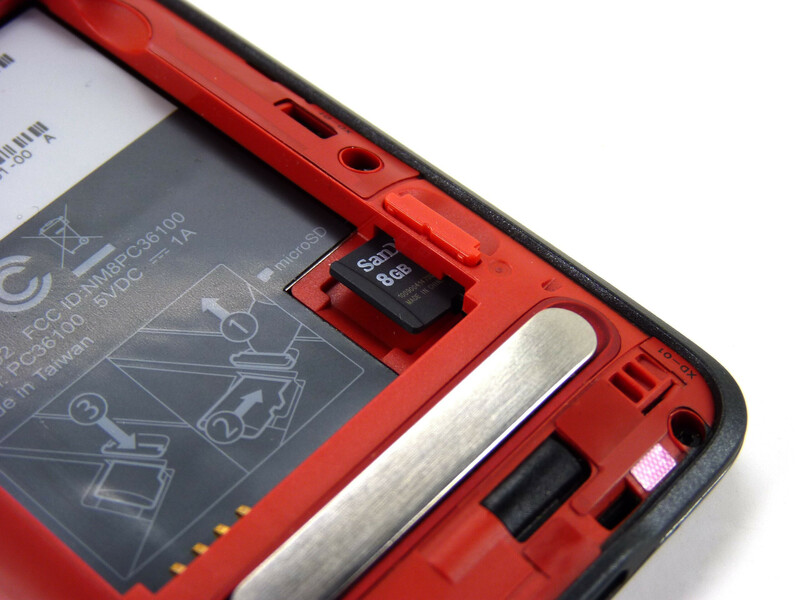 Unlike the HD2, the battery door covers the entire back housing and is coated in soft touch paint. Underneath is Ferrari-red, but this only slips out around the camera and when the kickstand is deployed. Earlier prototypes had a red earpiece grill, but unfortunately this has been replaced with silver- likely because the DROID Incredible features a red grill. In any case the EVO 4G is a good looking device; it blends the sheer masculinity of the DROID with the graceful lines of the iPhone to create a look all its own. 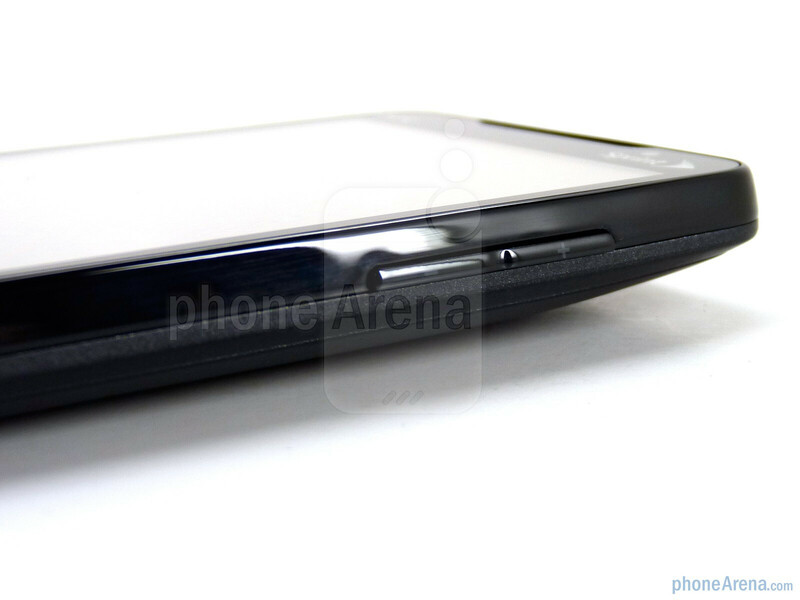 Then there is the 4.3” capacitive display, which absolutely takes over the HTC EVO 4G. It is bright and crisp and reading text on the EVO 4G is a dream. While it has received some flack for not being AMOLED we didn’t notice a real difference from the Nexus One, and the EVO’s TFT display was more usable in direct sunlight. Our complaint is that HTC continues to only use 65K color displays. With devices like the iPhone, Pre and DROID sporting 16M colors we don’t think that at least 262K is too much to ask for. You won’t look at the HTC EVO 4G and lament the display, but we’d bet if shoppers put it side-by-side with the Pre the difference would be noticeable to a discerning eye. At 6 ounces the EVO 4G is undoubtedly on the heavy side, but feels surprisingly good in the hand. The weight is well distributed and it feels more solid than the Nexus One did when holding it one-handed, though the EVO feels most comfortable when held two-handed. The size will obviously be a drawback for those with petite hands, but the phone didn’t overwhelm our medium-sized mitts. It is thinner than Sprint’s Hero and feels surprisingly similar in the pocket. The build quality is top notch, and with no moving parts the EVO 4G is definitely one of the most well put-together phones we’ve ever reviewed. There is no brushed aluminum or unibody, but the EVO is without a doubt a premium device. To sum it up in a word the HTC EVO 4G is stunning. It will be noticed, and it will be lusted after. Until now we’ve always given the title of best hardware to the iPhone 3GS, but there is a new undisputed heavyweight champion in town. And that’s before you even turn it on. i wouldnt really consider the kickstand to be a pro. i do think its a great idea but i dont think its something id keep in mind as beneficial over a different high end android device. True. I can't see it being used that much. yea, u say that until you want to watch a movie, voice call, or utube... then that kickstand will be a priority. We wants it my precious!!! I'm sure there are plenty of people that hate that this website has people that complain and post a useless comment on forums. From reading the review, Phone Arena, you really didn't go indepth with 4G speeds. Other sites went further indepth with 4G speeds and how they differentiate from 3G. Are you planning to do a comparison feature soon.? I still would love for them to go to a city with 4G and they do a cover piece on it. Agreed, it's way too big to be practical. However, the specs are really amazing, and it would be nice to see them in 4 or 3.7 size. there is a phone like that...Its teh HTC Incredible. Remember the Evo has the same resolution as the Increcible so that spec is not that much different. Bigger isn't always better. For me i want a 4.1 inch screen with better res better processor lighter than this...then i will upgrade from my Droid. Why no mention of battery life? there is mention of battery life, right on this very page. 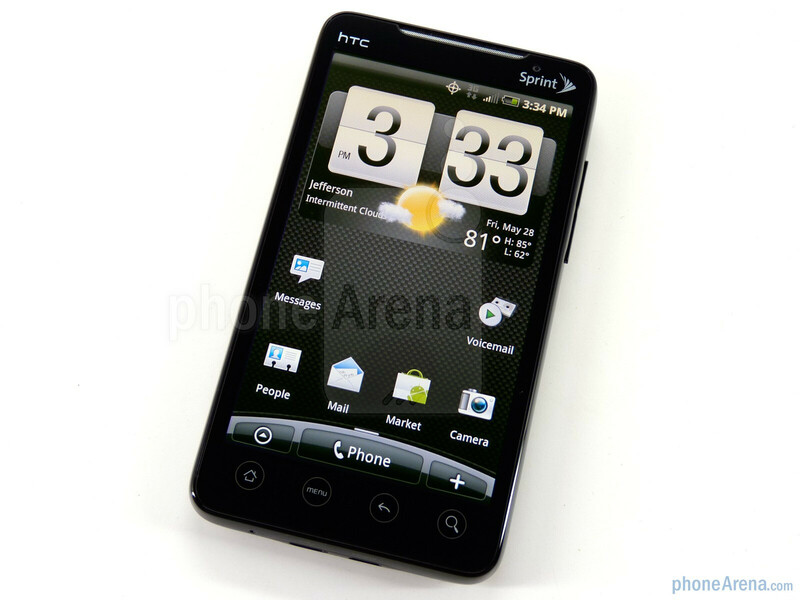 They said it lasted 6hrs 18mins talktime in their tests "Similarly to the Hero, the HTC EVO 4G uses a 1500mAh battery. However, instead of being rated at 4 hours of talk time, the battery on the EVO is rated 50% higher at six hours. We were a bit skeptical, especially with such a large display, but lo and behold we were able to achieve 18 minutes more than the rated time"
why U.S. only. htc why ? BEFORE GETTING NEW EVO PHONE FROM SPRINT The phone will cost $10 more per month and another $30 per month for hotspot! That's $40 more each month and not worth it. When ask about 4G in Tenn they said it is not slated for TN 12 months or more. What are we paying for. They say... the best camera and it is very fast. Every phone out today has a camera and I for one do not need a 8meg photo on my phone. I too was surprised that it was not just the additional $10 like had been discussed. But when I connected my iPad to my phone effortlessly while relaxing this weekend that $30 didn't seem like too big of a deal at all! It's all in perception. What does everyone pay monthly for their internet services? I would imagine it is more than $30! This phone is awesome! The only real complaint I have at this point is the lack of thought in design because the camera lens literally is what the phone rests on when on it's back - who's bright idea was that???? great phone and for a bluetooth just as advanced, check out the jawbone icon at bluetoothandbeyond.com they have the best prices on bluetooth headsets and a great warranty. THIS PHONE IS AWESOME!!!!! WISH IT HAS BETTER SCREEN RESOLUTION!!!!! AM I THE ONLY ONE WHO DOESN'T LIKE PICTURES OF A GRAVEYARD AS THE EXAMPLE OF HOW WELL THE CAMERA WORKS?!??!?! Anyway, I really want this phone, I'm scared to go to all touch though. Can any one tell me weather its (locked) on sprint only? or can i use it on other network using other sim card?